SNES Super Metroid (JPN/USA) "ingame time" in 41:22.47 by cpadolf. 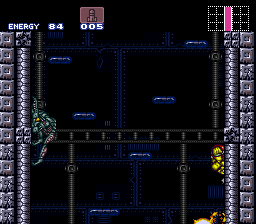 This Super Metroid movie by Cpadolf aims for in-game time, making use of the fact that the in-game timer is stopped during certain events. It's 25 seconds slower than Hero of the day's Super Metroid any% TAS in real time, but completes the game in 24 minutes and 4 seconds by its timer.